We always work hard to ensure that our customers are happy. This means working closely with the customer from the beginning right through to the end of the process. We are delighted that some of our customers have been kind enough to write us testimonials following our work on their properties. If you would like to hear more from our customers, we have a number of people who are happy to talk to you about Earthouse and some have even offered to allow new customers to visit their property and see some of the work Earthouse has done. Please do have a look at the testimonials below and visit our Blogs page for more detailed information about our work. 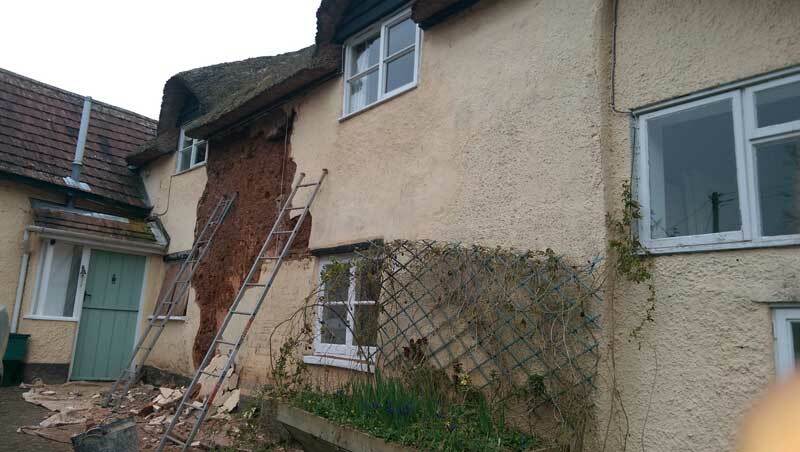 When our grade II listed cottage was hit by a car it seemed like a disaster, but in fact it was a huge blessing. Sean was contracted by the insurance company and bent over backwards to ensure that the cottage was repaired and renovated to an extremely high standard. Earthouse was extremely helpful in negotiating between the planning office and the insurance company and helped us insist on only the very best. A potentially stressful process was made so simple with their help and the results are fantastic. First repairing the impact damage from the crash they also corrected water damage issues in the walls we did not even know we had. Then they replaced the existing concrete render with lime to an excellent finish, something we had wanted to do for years. The cottage is far more stable than it was in the first place and is properly surfaced and finished. Finally they put in new windows and completed the finishing touches. Sean and Tom were friendly, professional and just good to have around… not what we expected from two months of building repairs. We already have and will continue to recommend Earthouse, thank you Sean! We are absolutely delighted with the work Sean did on our house. We have a cob constructed Devon longhouse and Sean did some remedial work on an internal section of wall which had worn and disintegrated over time. We were really impressed with the obvious care Sean took over his work and the finished result is truly beautiful. We’re very much looking forward to the day when we can get him in to do the rest of the house! There are bigger companies out there with bigger reputations, but this is a growing company with a growing reputation. The finish on our house is exceptional, and people in the street (including some builders down the road) often comment on how good it is. Indeed…..another house in the street has already had Sean render their house too. We contacted Sean because he was on a list of builders given to us by our structural engineer. When he came round to see us he showed real interest in our plans and a willingness to offer advice. Sean has continued to give us the benefit of his expertise and honest advice to ensure that the end product is of a high standard and achieved in the most cost efficient way possible. He has an excellent eye for detail and finish. We are pleased that we followed his suggestions. He personally visited the property at the weekend to make sure that the internal lime plaster was setting properly. We have found Sean and his team to be honest and trustworthy. 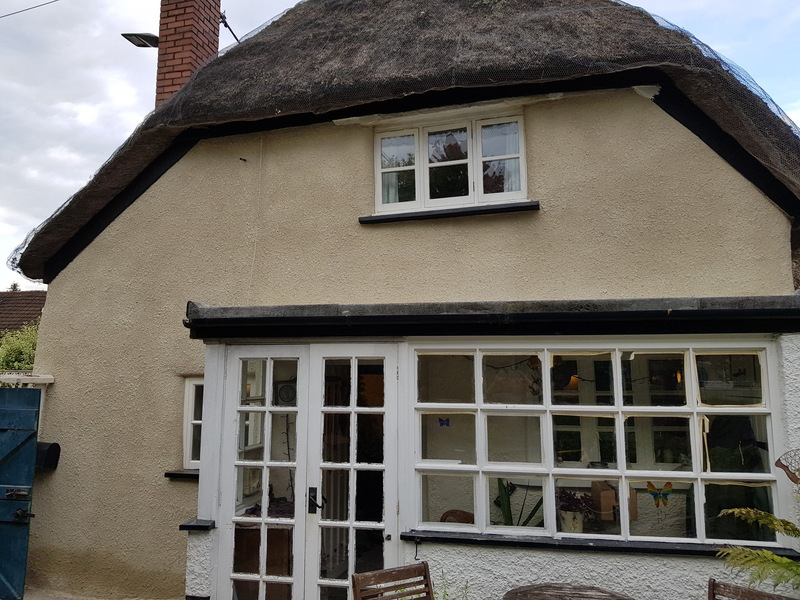 They repaired and rendered our main chimney, reinstated a lime plastered ceiling which had collapsed, created a replacement pad for a large structurally significant elm beam, plastered and rendered many walls including our north facing external wall. We think the window reveals they worked on have been beautifully executed. 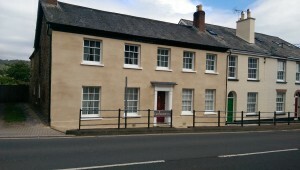 They also lime washed the external render the had applied. We would have no hesitation in employing Sean and his team again, and plan to do so. Another benefit of having Sean on your side is that he has a variety of contacts in the conservation trades who have proved equally talented. The local building control and conservation officers have been impressed by their standard of work. As the owners of a grade II listed building, we not only wanted to respect the regulations governing the nature of the work we can carry out, but also ensure that we ‘did the right thing’ by our building and worked with high quality craftspeople in its restoration. The first project was to re-render the front façade of the building in lime, a high profile project in that the building is on a very public high street. Having seen the work undertaken by Earthouse on a neighbour’s property, which was highly recommended by the owner, we were keen to discuss the project with Sean and his team. From the outset it was clear that Sean had a great feel for the work we required and was able to clearly understand what we wanted to achieve. An added bonus was that Earthouse’s strong reputation in working with listed buildings, and good relationship with the local council conservation department, meant that the officers were immediately reassured that the project was in safe hands. Sean and his team did an excellent job and also worked in a very accommodating fashion with the other trades we used on the project. Thank you Sean and I have no doubt that we will be using Earthouse for our next lime project. The walls and ceiling of the kitchen in our listed town house were in a really bad way and we were relieved when Sean was recommended to us. His mastery of traditional techniques and materials is second to none! He carefully restored part of the ceiling which had collapsed, building up layers to recreate the original pattern of the plasterwork by hand. A ceiling rose was also meticulously stripped of old paint to reveal the delicate detailing. The walls came in for similar treatment – rotten lathes and plasterwork were replaced where necessary and the existing lime plaster was repaired where it could be. Sean came up with a brilliant alternative to a tiled splash back, labouring over a panel of Venetian plaster until he had achieved a perfect finish. He also advised us on suitable paints to decorate the room, which is now the centre piece of our home. Sean and his team completed the project over a number of months and I wouldn’t hesitate to recommend them. Thank you, Sean. Earthouse do what they say they are going to do, in the time scale and do a great job. Sean Parker, who heads it up is straightforward, and knows what he’s doing with a wealth of knowledge and experience. He really understands what is required, especially with period buildings, listings etc. and how to do the work without the faff so often found amongst so called experts. I’ve been involved in doing up old buildings for years and Sean really is up there with skill and plain hard work. There is a great team around him, and all good to be around – watching them work was a real learning curve for me around lime render, lime wash, and the cob in our very old thatched cottage which really did need expert hands. I trusted them and always felt confident, and this trust wasn’t in any way misplaced. Highly recommended! We had a serious emergency with our rubble build house. A large section proved to have become disattached. Upon removing render and surveying a developing crack we discovered that there was was a separation you could almost put your head in! It became apparent that the cross passage extension in our Devon Longhouse had fallen down 3 times before during its very long term existence and had various methodologies used to try and keep it together. There was also separation of the inner and outer skins on one aspect. Earthouse were able to achieve an initial stabilisation of the structure and then repair using a mix of modern and traditional techniques whilst retaining the original that was salvageable. The end result is a stable structure that retains its original features and hopefully will remain so for very many more hundreds of years. We had seen works carried out by Earthouse on other buildings and were impressed with the results, plus they were able to help with the emergency. The quality of their work upon completion is impressive. My wife and I owned a Grade II listed cob farmhouse that had little work done to it for many years. Sean from Earthouse worked on various projects for us over about a five year period. 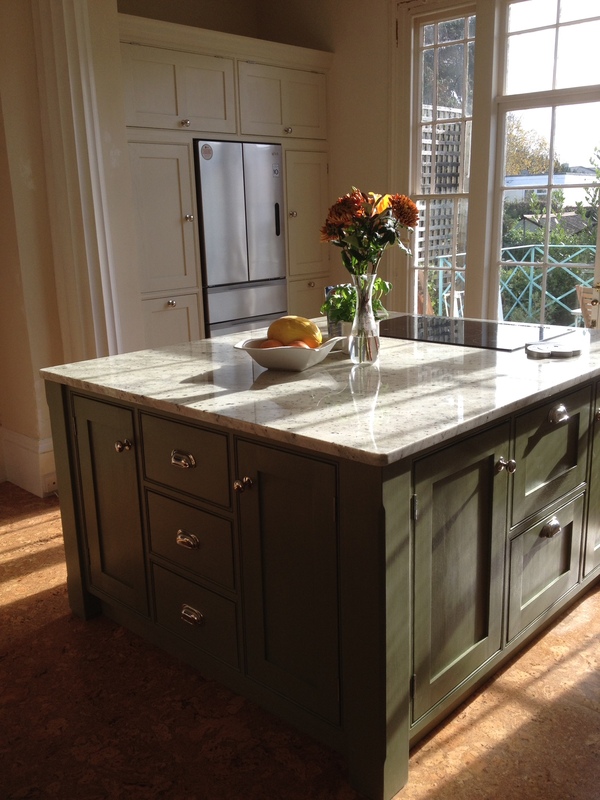 These included a complete restoration of a kitchen and the room above (replacement floors, plaster work, stonework, tiling, etc) as well as the restoration of a hallway and cloakroom. External work included stone walling, block paving and fencing. Sean’s friendly and consultative approach to the work was really appreciated. His eye for detail, care and pride in his work and meticulous approach to getting things absolutely right shone through in everything that he did. We were always delighted with every project that he undertook.